Bill is a native of Goldsboro, North Carolina. He came to Wilson after completing his ophthalmic training with American Optical Labs. Bill joined the staff of Wilson Clinic Eye Department in 1973 to complete his opticians internship and has been with the group for 35 years. Bill is licensed by the North Carolina State Board of Opticians and is certified by the American Board of Opticians. 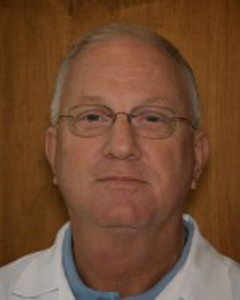 Bill has been a member of the North Carolina Opticians Association for several years of which he is a past president. He is also a member of the Opticians Association of America. Bill is active in his church, local Lions Club and communities activities. Bill and his wife Joy have two children and 4 grandchildren. An optician, or dispensing optician, is a technical practitioner who designs, fits and dispenses corrective lenses for the correction of a person’s vision. Opticians determine the specifications of various ophthalmic appliances that will give the necessary correction to a person’s eyesight. Some registered or licensed opticians also design and fit special appliances to correct cosmetic, traumatic or anatomical defects. These devices are called shells or artificial eyes. Other registered or licensed opticians manufacture lenses to their own specifications and design and manufacture spectacle frames and other devices. Corrective ophthalmic appliances may be contact lenses, spectacles lenses, low vision aids or ophthalmic prosthetics to those who are partially sighted. The appliances are mounted either on the eye as contact lenses or mounted in a frame or holder in front of the eye as spectacles or as a monocle. Opticians may work in any variety of settings such as joint practice, hospitals, eye care centers or retail stores. However, registered opticians have to meet standards of practice and training, commit to ongoing education, hold professional liability insurance and are held to these standards by their respective regulating bodies.